Tour starts and ends in Delhi, India. Motorcycle Rental required. Price includes Royal Enfield Bullet 500cc Motorcycle rental. This is adventure touring over the highest motorable roads in the world. Riding conditions will vary from great asphalt paved surfaces to gravel, rocky textures, some sand, stream crossings and everything in between. Traffic rides on the left side of the road, an easy and quick adjustment. 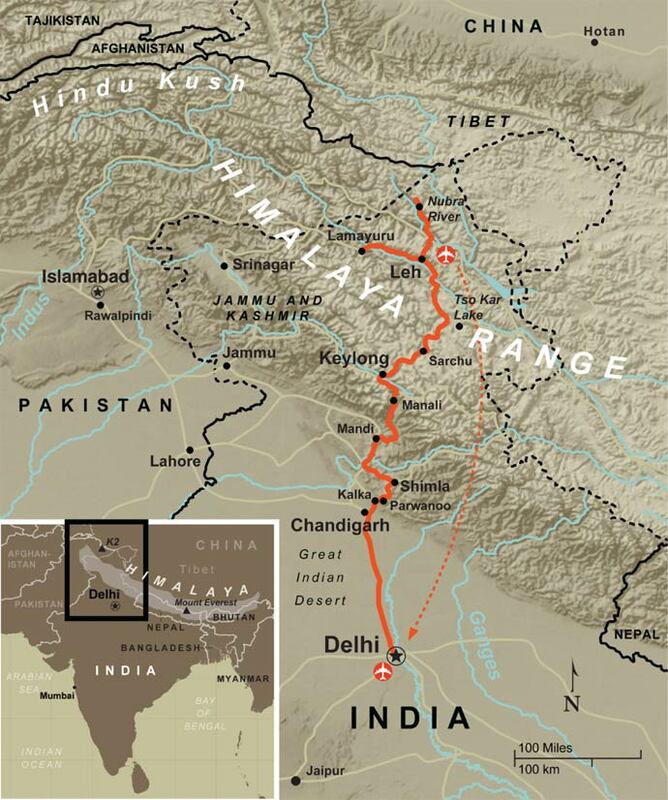 The remote nature of this Himalayan journey will require two to three nights of quality outfitted camping. The Highest Motorable Passes in the World. 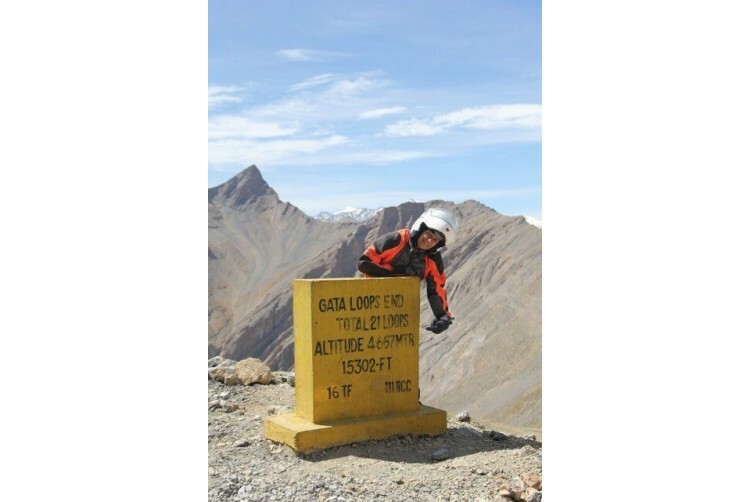 Riding across the highest motorable mountain passes in the world can be your claim on this unique India adventure. Each day is a fresh awakening as you leave behind the chaos of Delhi and make your way into the remote Tibetan Buddhist regions of the Himalayas known as Ladakh. You will ride over 7 passes ranging from 3,100 to 18,380 feet! The Royal Enfield 500cc Bullet is amazing. Even as you enter the thin air Khardung-La Pass (18,380 ft.) The Bullet is in perfect harmony with the environment, low to the ground, fast enough, reliable and in a single word…fun! It is not what you ride. It is where it takes you that counts.The bikes are the freshest fleet you will find in India. Riding to Ladakh offers participants mile after mile of stunning beauty. As you climb to the more remote corners of the Himalayas towards Leh, you’ll encounter Tibetan Buddhist temples, monasteries and monuments. The MotoDiscovery staff team is the best, reared and inspired by the late Patrick Moffat who was the earliest pioneer of this route and who first introduced us to this exotic corner of the globe. While here you should consider coming in a couple days early and we’ll arrange an optional overnight excursion to Agra to visit one of the great wonders of the world, the Taj Majal. The cuisine. With most meals included you discover the culinary delights, India is so famous for. Colorful curries and freshly baked naan breads are a staple, however, each distinctive. You will come to look forward to the regular stops to share masala chai with locals. It would not an event to introduce your pillion mate to the world of adventure touring. But if she has an adventurous bone in her body this is one you would want to share. The experience is so beyond description you’ll regret not having her along. If you are concerned about personal safety we feel very good about this event. This is not a tour for the novice rider and one should exercise the usual precautions when it comes to travel abroad. We have never had a negative experience in this part of the world. In a word, “challenging”. Driving in this part of the world requires your complete attention. The road conditions themselves throw a little of everything at you. Having previous off-road riding skills are recommended. If you enjoy riding off road you will love this one! And tell me about the motorcycle? We have an affection for the Royal Enfield Bullet. It is primitive, a machine from the past, yet it performs admirably. Speed is never a consideration here so the single cylinder 500cc motor is more than adequate. Our bikes have a reputation for being the best prepared and freshest available in India ( there are a lot of junk rentals floating around in India...beware!) The Bullets are a new generation with electric start, disk brakes, fuel injection and the shift is on the left side...as it should be. Some have so regarded the machine as key to the experience that they insisted on buying the bike and shipping it home to the USA at a considerable cost. Will I be impacted by altitude? Hard to tell. We attempt to design itineraries that permit gradual acclimatization, insist you remain hydrated and have Diamox ( a prophylactic that offsets some effects of altitude) handy should you request it. You will be crossing the world's highest motorable roads, at one point in excess of 18,000 feet! Common symptoms are a lack of appetite, sometimes a low-grade headache, a bit of lethargy. Most people overcome any adverse altitude symptoms in just a few days. Many feel nothing. If you have a history of sensitivity to altitude or any physical condition where altitude could negatively affect you, see your physician. Yes. You will need a single entry visa for India and it requires you to send off your passport. We will walk you through the process. It is quite simple. How is the food of India? If you are what we call a “meat and potato” kind of eater, you are probably going to find Indian cuisine pretty exotic. And it is. If you like colorful and exciting foods then it simply doesn't get any better than India. Curry, of course, is common and beef is rare. You are not likely to find it on this tour at all. We consider dining an important part of the MotoDiscovery experience. You won’t be disappointed. As is customary you will be met by a MotoDiscovery representative and transferred in a private vehicle to your hotel. What else can I do while in India? We strongly recommend you consider arriving a few days early to experience the wonder of Agra and the Taj Majal. It is an optional overnight excursion and we can plan it all for you. Look to receive in advance via e-mail attachments a comprehensive pre-tour information booklet that addresses all you will need to be prepared for your journey. Can I have a MotoDiscovery private custom tour just for me and my friends?